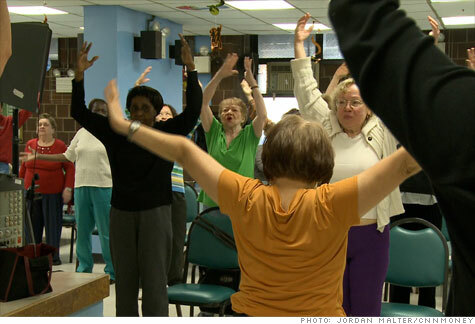 NEW YORK (CNNMoney) -- For the elderly, state budget cuts could mean no more daily hot meals and exercise classes to help prevent falls. At worst, some could even lose their beds at the nursing home. These and other lifelines for seniors may disappear as governors and lawmakers slash spending to close an estimated $112 billion in budget shortfalls, advocates say. Many state officials say they don't want to reduce senior services, but they have little choice due to massive deficits. But it's not all bad news. The funding for one senior program in Georgia was restored after legislators agreed the service was too important to cut. Here's a look at what's at risk for many of the nation's elderly. Among the most dramatic of the proposed cuts is the severe reduction in Medicaid reimbursement rates to nursing homes in Texas. Facing a shortfall of up to $27 billion, state lawmakers want to reduce the rate by 10%. But payments to nursing homes would plummet by a total of 34% because they would also lose federal matching funds. This could result in the shuttering of 850 of the state's 1,000 nursing homes, forcing up to 45,000 elderly residents to find other accommodations, said David Thomason, chair of the Texas Senior Advocacy Coalition. Texas nursing homes already lose money on Medicaid patients so they could not absorb another reduction, facility operators say. If rates were cut further, many would be forced to stop participating in the Medicaid program and would need to either close the buildings or convert them to other health-related uses. As it is, Sears Methodist Retirement System in Austin has to solicit donations and charge private patients more to make up the $4 million loss it suffers on its Medicaid residents, said Keith Perry, who heads the non-profit. If the cuts go through, Sears Methodist would have to stop caring for its roughly 400 Medicaid patients, whose average age is 84. "There's no way we could staff those facilities at those reimbursement rates," Perry said. This scenario is terrifying Carol Poor, whose 83-year-old mother lives in an Alzheimer's unit at Christian Care Centers in Gunter, a town north of Dallas. If her mother were discharged, Poor said she would have to retire early from her secretarial job to care for her mother since neither can afford to pay for a nurse or nursing home. "My mother worked and paid taxes all these years," said Poor. "She deserves someone to be there for her." Texas lawmakers did not return calls seeking comment. On a recent Wednesday in March, dozens of elderly New Yorkers gathered at the Clinton Senior Center in midtown Manhattan for an hour-long yoga class, followed by a hot lunch of pork chops, potatoes, and carrots. But they soon may have to fend for themselves if New York State does not restore $27 million in funding for New York City's senior centers. Without this money, Mayor Michael Bloomberg has said he'll have to close 105 of the city's 256 centers. Clinton would be one of them. The center's services are critical to keeping these low-income senior citizens living at home, said David Gillcrist, executive director of Project Find, which runs Clinton. They receive a nutritious meal and take classes that improve their balance, strength and confidence. Equally as important, they are able to socialize with friends and not become isolated and depressed. All these services help keep the seniors out of hospitals and nursing homes, which would ultimately cost the city a lot more than the $367,000 it provides to Clinton, Gillcrist said. "It makes no sense to gut one-third of the support network that lets senior citizens age independently," he said. The city's Department of Aging is trying to blunt the impact of the cuts by maintaining as many services as possible, said a Bloomberg spokesman. But the city, which is facing a $4.6 billion shortfall, cannot make up for the elimination of the state funds. A spokesman for Gov. Andrew Cuomo did not return an email seeking comment. Some of the most draconian cuts may never take place if state lawmakers can find money elsewhere in the budget to restore funding. This just happened in Georgia. Senior services agencies there had a few tough weeks, when it looked like they'd lose a million dollars of funding for Meals on Wheels. Agencies prepared to stop feeding a total of 138,000 elderly residents. Georgia reduced its support for Meals on Wheels in 2009, supplanting it with $1 million in federal stimulus money. That federal funding is running out this year. Gov. Nathan Deal did not replace it with state money. Patricia Lyons, who runs Senior Citizens Inc. in Savannah, prepared for the worst. She asked her staff to assess whom to drop from the rolls. She wanted to make sure the most vulnerable didn't get cut, since her drivers not only deliver food, but check to make sure the elderly haven't fallen or gotten sick. "If someone loses their meals, it's only a matter of time before they end up in a nursing home," said Lyons, who receives $500,000 from the state for Meals on Wheels. "It's more than a meal to these people. It's a lifeline." Lawmakers agreed that the program was too important to gut. The state Assembly restored the funding in early March by cutting some other contracts in the budget, and the Senate is expected to follow suit soon. "It's much cheaper to keep the folks at home and it's much more compassionate," said Sen. Renee Unterman, who heads the health and human services subcommittee. Though they are grateful to have the money restored, agency directors say they need even more from the state to handle all their requests for help. At Middle Flint Council on Aging, an agency in Americus, it can take five months for the elderly to start getting meals. The number of people on the wait list, which now stands at 472, keeps growing, said Norm Graves, the agency's director. Graves said he tries to find alternate aid for those who come to the agency, but it's hard since all social service groups are financially strapped. "It's a struggle to find them a care package to get them through to the next week," he said.